Arkansas Gov. Asa Hutchinson signed into law Friday his plan to keep the state's first-in-the-nation hybrid Medicaid expansion and urged fellow Republicans to avoid a Washington-style shutdown fight over their efforts to defund the program. The bills outline Hutchinson's proposal to rework the program, which uses federal funds to purchase private insurance for more than 250,000 low-income people. The House and Senate approved the measures Friday by wide margins, but they were shy of the three-fourths support a Medicaid budget bill funding the program will need in an upcoming legislative session. The program has received unanimous support from Democrats but has sharply divided Republicans who control both chambers of the Legislature. Some opponents of the expansion have vowed to vote against any Medicaid budget bill that includes the program. But Democrats and many Republicans are just as likely to oppose a measure without the expanded coverage. "That's what leads to government shutdowns in Washington. 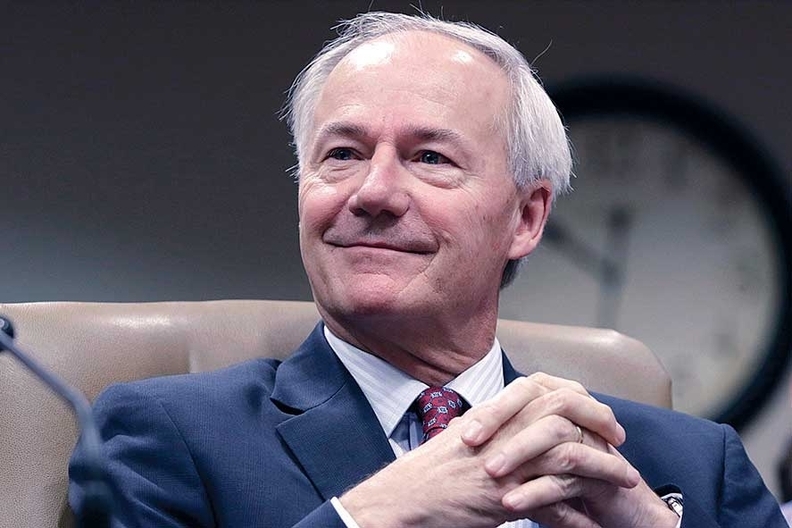 We've never had that in Arkansas," Hutchinson said after signing the measures. "I don't expect to have that under my watch. But those are the consequences that are real, and it's real to tens of thousands of people in Arkansas who are dependent upon these services." Arkansas was the first state to win approval for its hybrid approach, created three years ago as an alternative to expanding Medicaid under the federal health law. Hutchinson has proposed adding new restrictions, including a requirement that some participants pay premiums, and renaming the program "Arkansas Works." Opponents have called the program an embrace of the federal health care law Hutchinson and other Republicans have called for repealing and are pushing for a separate vote on the program's funding. They've also suggested plans that would either cap enrollment and wind down the expanded coverage or end it Dec. 31 so Hutchinson could negotiate a new program with the next president. "I've been consistent in saying I think it's a detriment to the state of Arkansas what we're doing," said Republican Sen. Terry Rice, who said he's prepared to vote against the Medicaid budget if necessary to stop the program. "Short term, it looks good. But I'm looking long-term ... and there is more coming than we're being shown and being told." Other opponents, however, have left open the possibility of supporting the budget bill if they can't vote on the expansion alone. "Nobody wants to shut down (the Department of Human Services) over all this, certainly not myself or anybody on either side of this issue," said Republican Sen. Scott Flippo, who voted against the expansion plan but stopped short of saying what he'd do if the expansion isn't stripped from Medicaid's budget. Hutchinson rejected the idea of a separate vote. "That vote has been taken. We have voted on Arkansas Works and it's been adopted by a majority of both parties and both chambers," Hutchinson said. Hutchinson has warned that ending the expanded coverage would mean a budget deficit of at least $100 million, which he says would mean steep cuts for some state agencies. House leaders say they've been preparing an alternative to Hutchinson's proposed $5.3 billion budget to show members the consequences of ending the program. "It is a very real stepdown from what we're able to do in a Plan A scenario," said House Speaker Jeremy Gillam, a Republican. "If we did not have this money, it would be impactful." The Legislature will take up the funding bill at a session set to begin Wednesday that will focus primarily on the state's budget. Legislative leaders say they can look at smaller and cash-based agencies initially but that major budget questions can't be answered until the expansion's future is decided. "Until you know what happens to Arkansas Works ... you really can't do a budget," said Democratic Sen. Larry Teague, who co-chairs the Joint Budget Committee. "It'll be challenging."